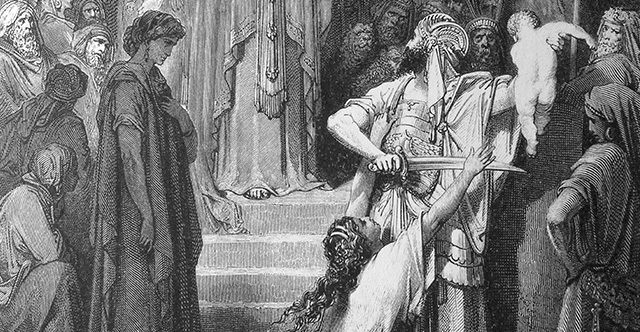 1 Solomon made an alliance with Pharaoh, the king of Egypt, and married one of his daughters. He brought her to live in the City of David until he could finish building his palace and the Temple of the LORD and the wall around the city. 2 At that time the people of Israel sacrificed their offerings at local places of worship, for a temple honoring the name of the LORD had not yet been built. 3 Solomon loved the LORD and followed all the decrees of his father, David, except that Solomon, too, offered sacrifices and burned incense at the local places of worship. 4 The most important of these places of worship was at Gibeon, so the king went there and sacrificed 1,000 burnt offerings. 5 That night the LORD appeared to Solomon in a dream, and God said, “What do you want? Ask, and I will give it to you!” 6 Solomon replied, “You showed great and faithful love to your servant my father, David, because he was honest and true and faithful to you. And you have continued to show this great and faithful love to him today by giving him a son to sit on his throne. 7 “Now, O LORD my God, you have made me king instead of my father, David, but I am like a little child who doesn’t know his way around. 8 And here I am in the midst of your own chosen people, a nation so great and numerous they cannot be counted! 9 Give me an understanding heart so that I can govern your people well and know the difference between right and wrong. For who by himself is able to govern this great people of yours?” 10 The Lord was pleased that Solomon had asked for wisdom. 11 So God replied, “Because you have asked for wisdom in governing my people with justice and have not asked for a long life or wealth or the death of your enemies— 12 I will give you what you asked for! I will give you a wise and understanding heart such as no one else has had or ever will have! 13 And I will also give you what you did not ask for—riches and fame! No other king in all the world will be compared to you for the rest of your life! 14 And if you follow me and obey my decrees and my commands as your father, David, did, I will give you a long life.” 15 Then Solomon woke up and realized it had been a dream. He returned to Jerusalem and stood before the Ark of the Lord’s Covenant, where he sacrificed burnt offerings and peace offerings. Then he invited all his officials to a great banquet. 16 Some time later two prostitutes came to the king to have an argument settled. 17 “Please, my lord,” one of them began, “this woman and I live in the same house. I gave birth to a baby while she was with me in the house. 18 Three days later this woman also had a baby. We were alone; there were only two of us in the house. 19 “But her baby died during the night when she rolled over on it. 20 Then she got up in the night and took my son from beside me while I was asleep. She laid her dead child in my arms and took mine to sleep beside her. 21 And in the morning when I tried to nurse my son, he was dead! But when I looked more closely in the morning light, I saw that it wasn’t my son at all.” 22 Then the other woman interrupted, “It certainly was your son, and the living child is mine.” “No,” the first woman said, “the living child is mine, and the dead one is yours.” And so they argued back and forth before the king. 23 Then the king said, “Let’s get the facts straight. Both of you claim the living child is yours, and each says that the dead one belongs to the other. 24 All right, bring me a sword.” So a sword was brought to the king. 25 Then he said, “Cut the living child in two, and give half to one woman and half to the other!” 26 Then the woman who was the real mother of the living child, and who loved him very much, cried out, “Oh no, my lord! Give her the child—please do not kill him!” But the other woman said, “All right, he will be neither yours nor mine; divide him between us!” 27 Then the king said, “Do not kill the child, but give him to the woman who wants him to live, for she is his mother!” 28 When all Israel heard the king’s decision, the people were in awe of the king, for they saw the wisdom God had given him for rendering justice.